My wife ordered me one of these. Her logic was that it was just a matter of time before I would buy it anyway. If it comes before Christmas a big dent in her shopping list would be made. It would save her some time on finding a present for someone like me who buys more presents for myself than others when holiday shopping. I haven't started any sort of shopping. She is way ahead of the game. A bunch of my friends get together from time to time to celebrate our iron adventures. 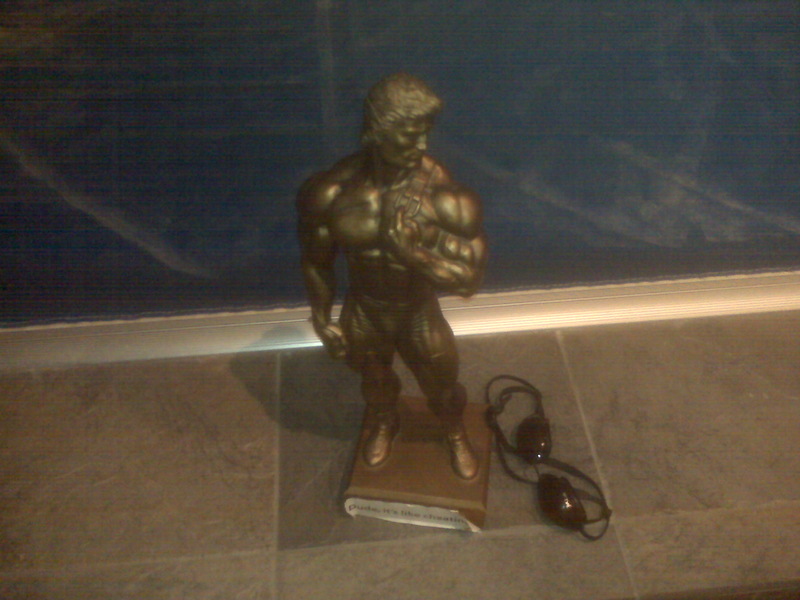 The last person who has finished a 140.6 event gets the following trophy that needs to be prominently displayed. This is one of the ugliest trophies ever (I put in goggles for reference on the size (about 2 ft tall) in this picture). I wonder where Casey got it as this cannot be a common trophy. I can't wait until IMLP2012 for either Lell or Carey to take ownership of it. Tim had a good idea relater to the NYC26.2, His plan is to apply for the lottery and if he doesn't get in, go the charity route. Interesting thought and I'm considering the same deal now. Wonder what the ante is. I went for a real run on Saturday. All felt good and I kept it short on purpose. 3 miles with no issues is a win. Sunday I joined the TNT faithful for a bike ride. They typically spend more time laughing than riding hard but this ride was just what I needed. 38 miles later I was sorry it was over. That is the mindset I've been searching for. My wife bought tickets to see the Boston Pops playing a holiday concert at the Tilles Center and we went Sunday afternoon. I like to support the arts, my kids are big into music, and my wife is completely in the holiday mode. It was a full house. Maestro Lockhart and co. did a good show (featuring Rockapella and others including the big guy (Santa) himself. During the show they announced that this was the kickoff for the holiday season with all the other various concerts scheduled. I have done nothing holidayish so far so I guess I need stop slacking. Anyone else do nothing yet for the holidays? 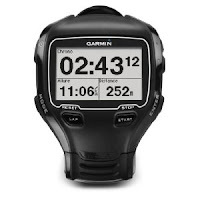 I was looking at that Garmin reviews and was seriously drooling over it but my old one is working just fine (darn!) so no pre-ordering for me. Being in Holiday Mode is a nice place to be. 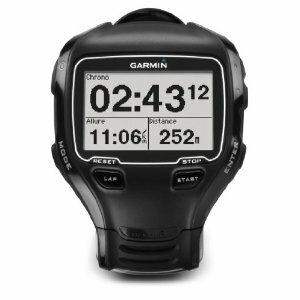 Especially when there's a new garmin on the way! Your wife is a good woman - totally drooling. That trophy is pretty crazy. NYC would be cool to do one time. I really enjoyed the book "A Race Like No Other" that gave a pretty detailed description of the course along with some cool stories from the 2007 run. Three miles with no issues is always a win for sure. 38 on a bike and wanting more makes you a bike stud. I did the Jingle Bell Run for Arthritis and put up a tree this weekend. I've bought just a few gifts. I'm having a hard time coming to terms with the fact Christmas is coming. I'm way behind! Maybe I need more music! Boston Pops would work! You are right in that the trophy is hideous, but at the same time how cool. That is awesome that you pass it along and I'm sure it inspires more than one person to go the 140.6 route just to have the ugly trophy. So another IM in 2013? Sounds good! What about IM Wisconsin? I think that one will be on my list in 2013. I am thinking about IMFL this year as I can still get in via Endurance Sports Travel. Happy New Year and thanks again for your support!